The German merchant fleet consists of about 850 ships of over 1000 GRT. 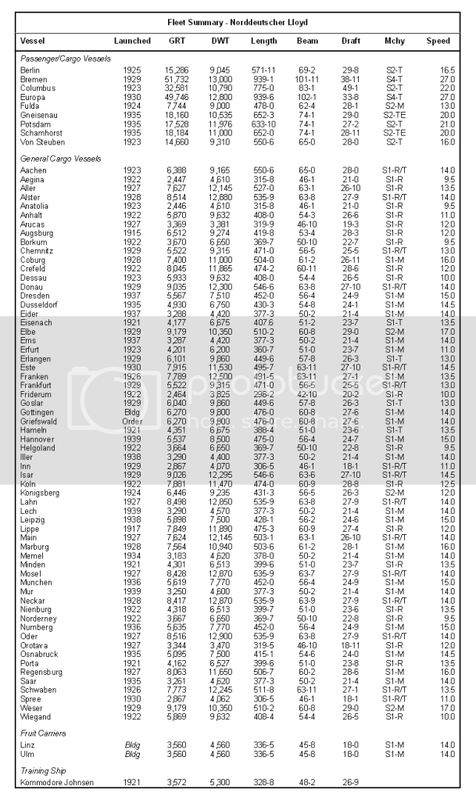 Its total capacity is 3,843,584 GRT. As of 31 December 1939 the NDL fleet comprised 75 ships of more than 1,500 GRT, including nine large passenger and passenger cargo vessels, 62 cargo ships, two specialised fruit carriers and one sail training ship. The total tonnage of the NDL fleet amounted to 590,823 grt and 637,472 dwt. Details are appended. 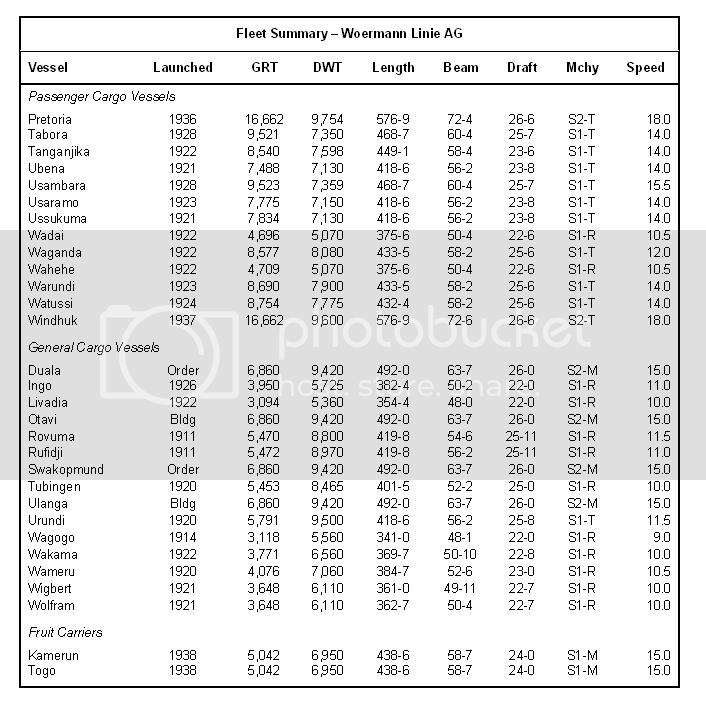 As of 31 December 1939 the DDG Hansa fleet comprised 42 ships of more than 1,500 GRT, comprising 42 cargo ships, The total tonnage of the DDG Hansa fleet amounted to 292,262 grt and 415,406 dwt. Details are appended. As of 31 December 1939 the Oldenburg-Portugiesische fleet comprised 21 ships of more than 1,500 GRT, including sixteen cargo ships, three specialised fruit carriers and two oil tankers. 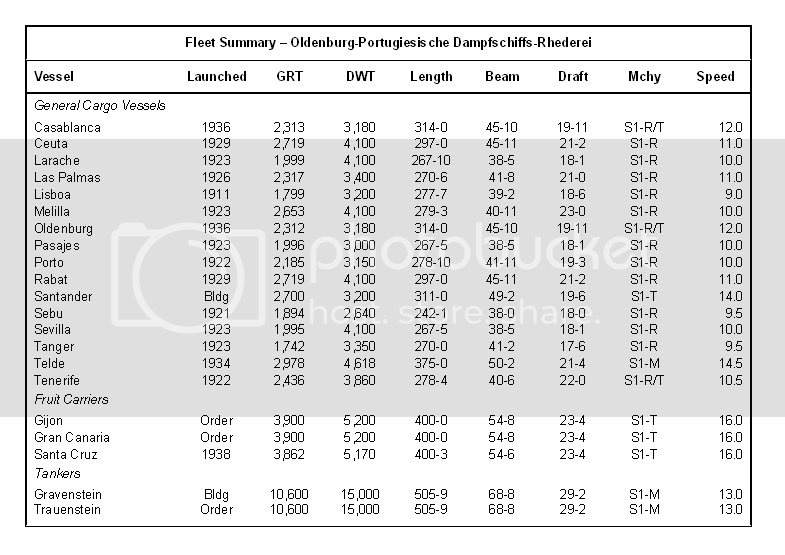 The total tonnage of the Oldenburg-Portugiesische fleet amounted to 69,619 grt and 102,848 dwt. Details are appended. As of 31 December 1939 the HAPAG fleet comprised 106 ships of more than 1,500 GRT, including fourteen large passenger and passenger cargo vessels, 90 cargo ships and two specialised fruit carriers. The total tonnage of the HAPAG fleet amounted to 770,063 grt and 953,316 dwt. Details are appended. As of 31 December 1939 the DDG Hansa fleet comprised 11 ships of more than 1,500 GRT, comprising two cargo ships, seven specialised fruit carriers and two sailing vessels. The total tonnage of the Laeisz fleet amounted to 42,753 grt and 50,556 dwt. Details are appended. As of 31 December 1939 the Sloman fleet comprised 21 ships of more than 1,500 GRT, comprising seventeen cargo ships, two specialised fruit carriers and two oil tankers. 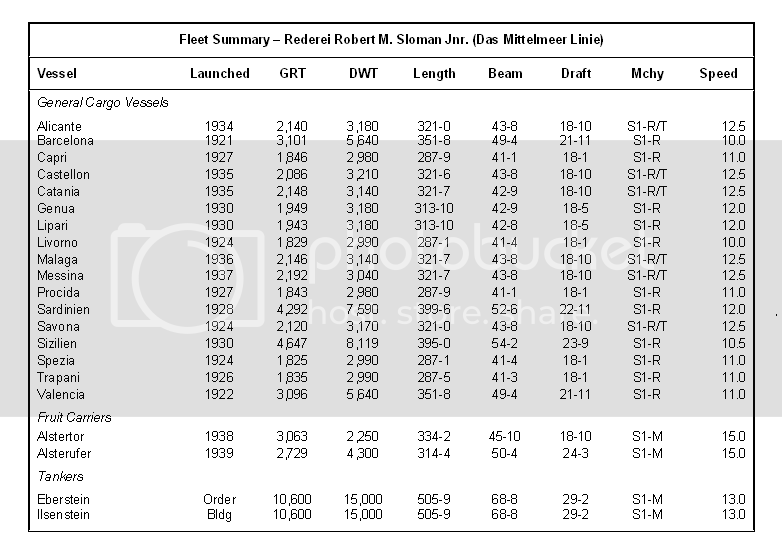 The total tonnage of the Sloman fleet amounted to 68,030 grt and 103,709 dwt. Details are appended. As of 31 December 1939 the Woermann fleet comprised 30 ships of more than 1,500 GRT, comprising thirteen passenger-cargo ships, fifteen general cargo ships and two specialised fruit carriers. The total tonnage of the Woermann fleet amounted to 204,446 grt and 226,766 dwt. Details are appended. As of 31 December 1939 the Essberger fleet comprised eleven ships of more than 1,500 GRT, comprising two general cargo ships and nine oil tankers. 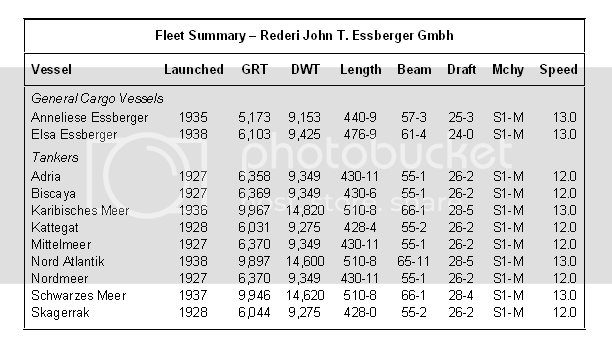 The total tonnage of the Essberger fleet amounted to 78,628 grt and 118,564 dwt. Details are appended. 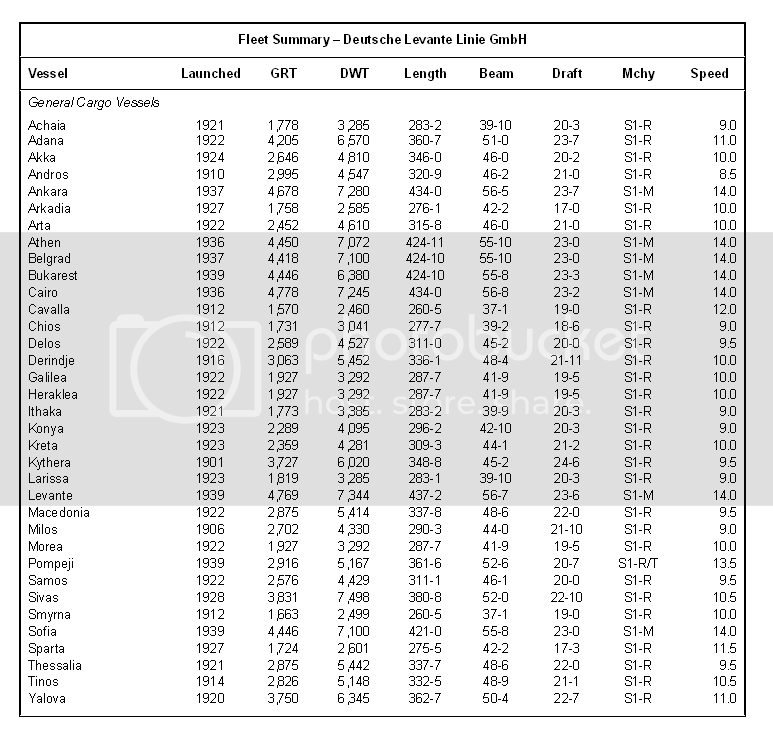 As of 31 December 1939 the Deutsche Levante fleet comprised 35 ships of more than 1,500 GRT, comprising 35 cargo ships, The total tonnage of the Deutsche Levante fleet amounted to 102,258 grt and 171,223 dwt. Details are appended. As of 31 December 1939 the Hamburg-Sudamerika fleet comprised 56 ships of more than 1,500 GRT, including sixteen passenger cargo vessels and 40 cargo ships. 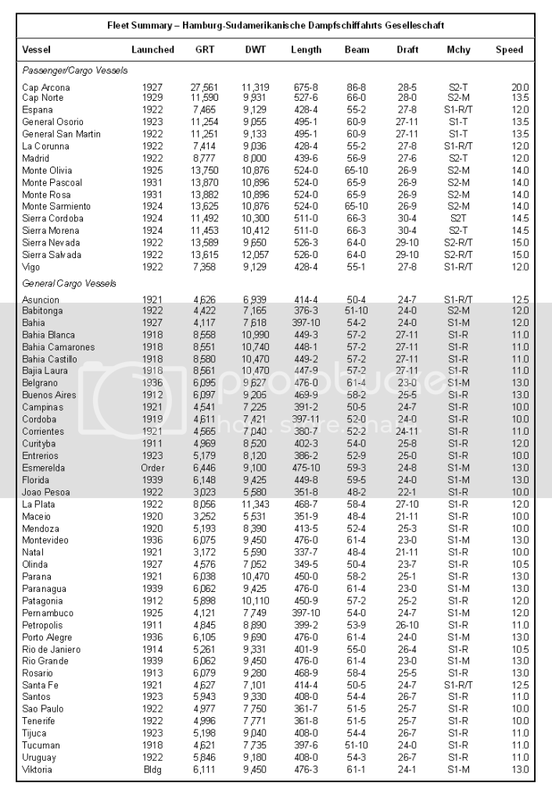 The total tonnage of the Hamburg-Sudamerika fleet amounted to 420,149 grt and 505,458 dwt. Details are appended. 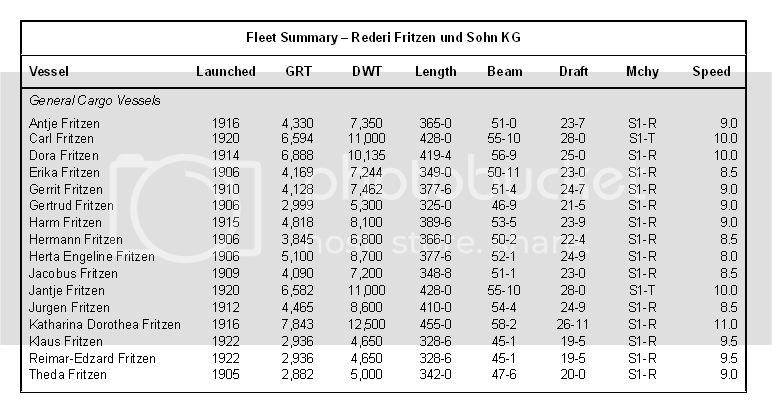 As of 31 December 1939 the Fritzen fleet comprised 16 ships of more than 1,500 GRT, comprising 16 cargo ships, The total tonnage of the Fritzen fleet amounted to 74,605 grt and 125,691 dwt. Details are appended. As of 31 December 1939 the Baltische-Amerikansiche fleet comprised 13 ships of more than 1,500 GRT, comprising 13 specialised oil tankers. The total tonnage of the Baltische-Amerikansiche fleet amounted to 111,059 grt and 170,120 dwt. Details are appended. As of 31 December 1939 the Deutsche-Amerikanische fleet comprised 13 ships of more than 1,500 GRT, comprising 13 specialised oil tankers. 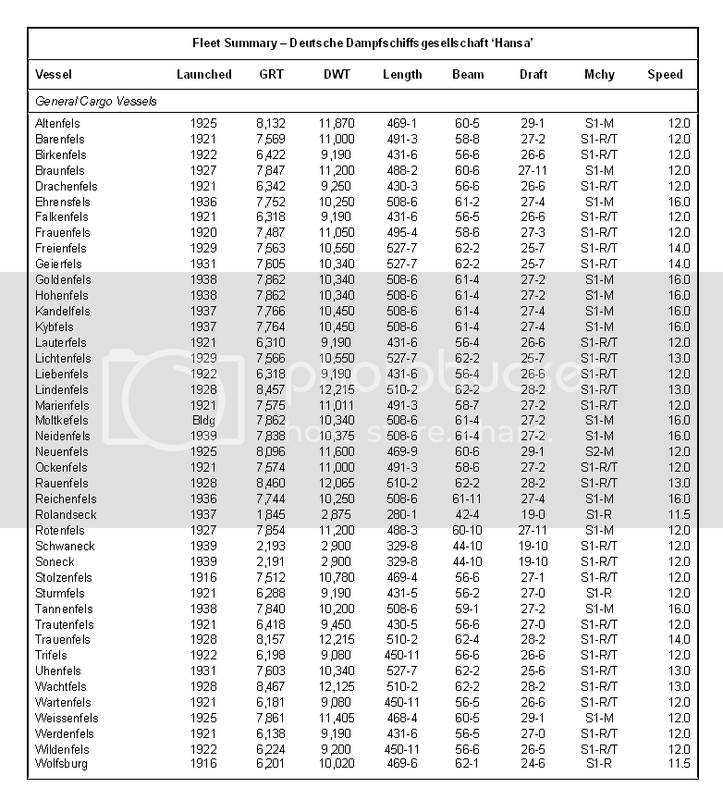 The total tonnage of the Deutsche-Amerikanische fleet amounted to 140,842 grt and 225,970 dwt. Details are appended. As of 31 December 1939 the Blumenthal fleet comprised 7 ships of more than 1,500 GRT, comprising 7 general cargo ships. The total tonnage of the Blumenthal fleet amounted to 13,367 grt and 22,272 dwt. Details are appended. As of 31 December 1939 the Bolten fleet comprised 7 ships of more than 1,500 GRT, comprising 7 general cargo ships. The total tonnage of the Blumenthal fleet amounted to 25,160 grt and 42,346 dwt. Details are appended. As of 31 December 1939 the Europaische Tankreederei fleet comprised 7 ships of more than 1,500 GRT, comprising 7 specialised oil tankers. The total tonnage of the Europaische Tankreederei fleet amounted to 66,994 grt and 103,613 dwt. Details are appended. As of 31 December 1939 the Fisser und von Doornum fleet comprised seven ships of more than 1,500 GRT, comprising seven general cargo ships. 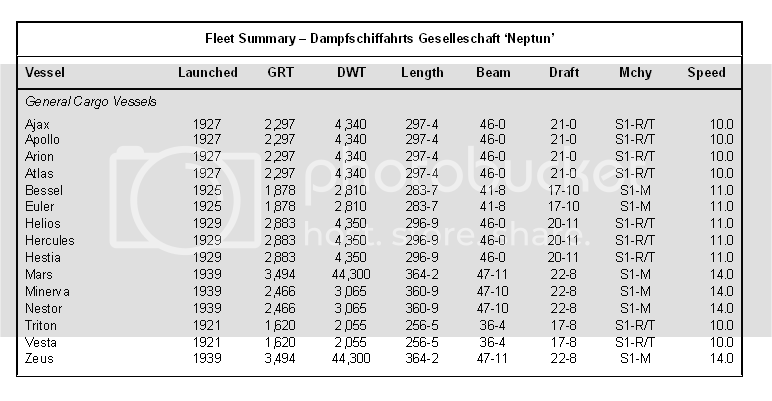 The total tonnage of the Fisser und von Doornum fleet amounted to 31,533 grt and 53,513 dwt. Details are appended. As of 31 December 1939 the Seereederei Frigga fleet comprised twelve ships of more than 1,500 GRT, comprising twelve general cargo ships. 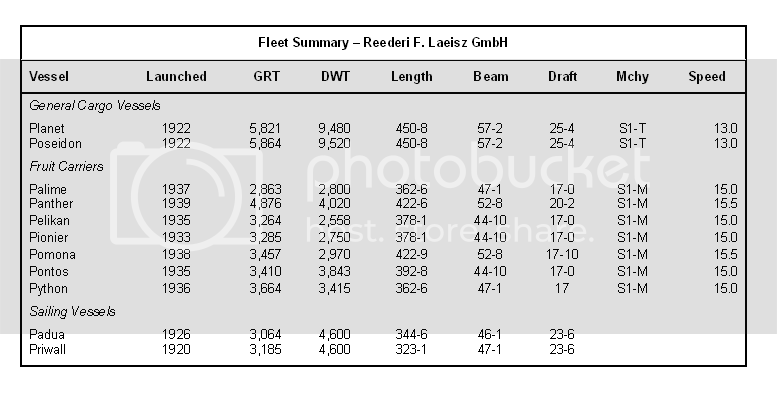 The total tonnage of the Seereederei Frigga fleet amounted to 57,468 grt and 90,249 dwt. Details are appended.